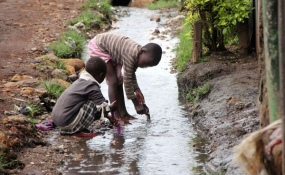 Children play with flowing water at Nyalenda slums in Kisumu (file photo). Researchers from IHE Delft Institute for Water Education and their peers from Uganda and Tanzania have found traces of 25 DNA virus families -- some of them with adverse health risk for humans -- in underground water in the slums of Kampala and Arusha. "These viruses have never been found on such a large scale in ground water. Perhaps it is because there has never been an in-depth analysis," said Dr Jan Willem Foppen, one of the lead researchers and a hydrologist at the IHE Delft -- the largest graduate water education institution on the planet. "We found 25 DNA virus families, of which 14 are from above ground hosts like frogs, mice, rats, cows, horses, monkeys and humans," Dr Foppen said. "This could be just a tip of the iceberg. We have not found all the viruses. We found the most abundant ones," Dr Fopen said. "Let's do something about sanitation. Let us improve our sources of drinking water and identify new pathways with communities towards sustainability."